I've been a non-buying minimalist for awhile now, so I have a pretty good grip on my list of things I just completely do not purchase anymore. Since deciding to fully embrace minimalism, there's a lot of things I've stopped buying in fact. And not just minimalism - going cruelty free, zero waste, chemical free, all natural, vegan (vegan-ish. Cheese, man. 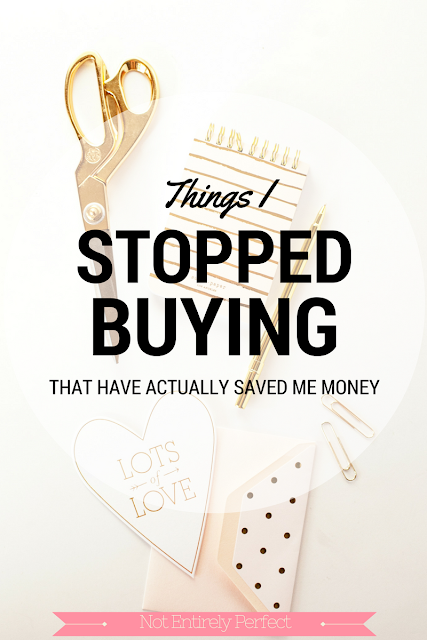 ), all of those things led to a laundry list of things that I don't buy anymore. But that doesn't mean I automatically save money. Because sometimes it required finding a replacement product. Just because you cut out Starbucks doesn't mean you're not still spending to make coffee at home, right? Here's a couple of things that I stopped buying and have actually saved money by doing so. I don't spend any money on books because I don't keep any in the house. I will only rent books from the library and since the huge Harold Washington Library is about 4 blocks from my office, I'm not even spending gas money to go get them. Plus I can rent a ton of books as e-books and read them on any device. I also don't buy magazines anymore. I used to always get a couple but now the content isn't super interesting to me - funny how that happens when you stop looking for the new makeup, clothes, home decor, etc. Real Simple is one I still enjoy but I never feel the need to buy it. I flip through it at my mom's house, she has a subscription. One I got for her for free, from Recyclebank. I've mentioned it before, but you read through articles and slideshows (they take just 1 minute each) about recycling and the environment and earn points. You redeem the points for a number of things, magazine subscriptions being one of them. I think you could earn enough points for a year long subscription to Real Simple in a matter of minutes. Since I replaced books and magazines with totally free versions of these things, that's 100% savings. 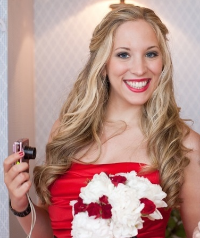 Once I started cutting out bad chemicals from my hair care, I decided to just let my hair do what it wants for awhile to see what I would actually need. I don't like to use heat on my hair as it is, so frizz serum and hair spray and heat protectant and everything else seemed silly. Pretty quickly I figured out that my hair didn't need styling products if I (a) washed it less often and (b) used more natural shampoo and conditioner that didn't strip my hair with SLS ingredients (what makes it foam.) If I use dry shampoo - and my dry shampoo is arrowroot powder - I can go an entire week without washing my hair. True story, Sunday to Sunday. And it'll look perfectly fine. If I don't use the arrowroot powder, I have to wash my hair twice a week. That's it. I have never washed my hair every day, so I didn't have a greasy detox period to push it longer, which helped, but there are all sorts of guides on the internet about how to push your particular hair type longer between washes, thus keeping it healthier. I switched to more natural shampoos and conditioners (the Shea Moisture line) and then just started making my own with honey and coconut oil and I find that I don't need any styling products. The savings on styling products is 100%, and since the honey and coconut oil acts as shampoo and conditioner, and doesn't take much, it saves on those items too. This one is a big money saver for me, currently. That's not so say I'll never buy these things again, but I'm not using any sort of paper in my planning and organization right now at all. It's all digital. I have a post coming up about this on Friday, a whole update on my new system and what's working for me at the moment. So not only have I stopped buying planners (those fancy ones can get pricey, like $60 at least! ), but I've also stopped buying pens, notepads, paperclips, sticky notes, stickers, all the typical things you associate with a planner. It's so nice to have that money freed up, though I admit the stationery aisle still draws me in. I've been holding steady though - looking, no buying. One day I'll stop looking too. One day. I have plenty of things I've stopped buying that have save money in other ways, because the replacement products I bought were reusable and cheaper in the long run. I'll probably be mentioning most of those when I post about zero waste essentials so you'll see what I'm talking about. These are just the things that have saved me 100%. 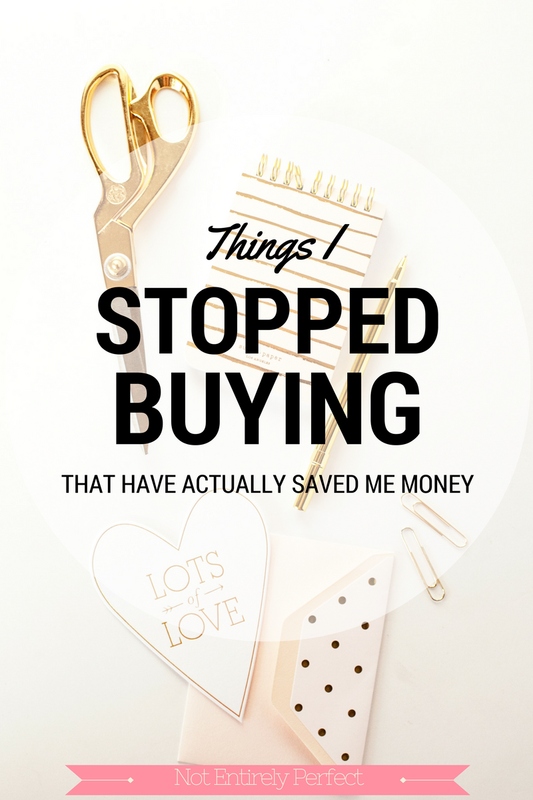 What have you stopped buying lately that actually saves you money?